Deer near the Parx Casino in Bensalem, PA.
Later this month, a Lancaster County deer farm will be dubbed a "disease management area" to try and contain an untreatable illness found in Pennsylvania's deer population: chronic wasting disease. 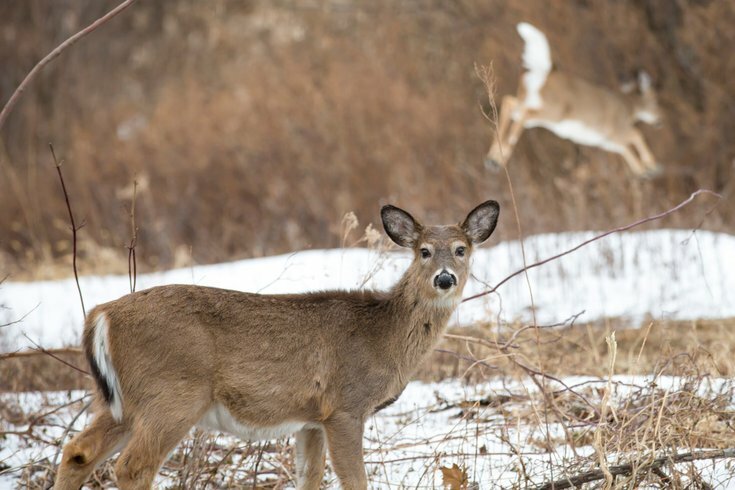 In the past few years, the disease has spread among Pennsylvania's white-tailed deer population, forcing game officials to try and contain it and hunters to be wary of it when bagging a trophy. The disease was initially discovered in the United States among captive deer in the 1960s in Colorado, and in wild deer In 1981. Since then, CWD has been detected in 22 states. It was first found in Pennsylvania in 2012, and this past hunting season 51 deer have tested positive for CWD. CWD is found in cervids, or mammals of the deer family. The disease is contagious and "always fatal," according to the Pennsylvania Game Commission. It's believed to be transmitted by infectious particles – called prions — that attack the brain and nervous system, resulting in the death of brain cells and tiny holes in the brain tissue. Late stage symptoms of CWD-infected animals include an extreme loss of body condition; excessive drinking, urination, salivation, and drooling; and behavioral and neurologic changes such as repetitive walking patterns, droopy ears, a wide-based stance, and listlessness. Some animals lose their fear of humans and predators. CWD has been detected in these areas in both captive and free-range deer, and the PGC not only continuously tests deer in these areas but also encourages hunters to submit deer they kill to be tested. This past season, hunters in the two DMAs dropped off more than 1,500 deer heads for free testing. Hunters are being told to take precautions of their own; they're forbidden from using certain traps and certain lures, such as urine-based scents. And while there's no evidence of CWD transmitting to humans, studies suggest it does pose a risk to some non-human primates like monkeys, so hunters are being told not to eat meat from a deer that tests positive for CWD. The farm has been under quarantine since December, according to the Pennsylvania Department of Agriculture, when Wisconsin officials first notified Pennsylvania of the possible link. PGC officials will announce the boundaries for the DMA around the farm on Feb. 28. Again, with no treatment and no vaccine, the strategy for addressing the disease continues to be testing and containment. “By developing a control program where we go into these hotspots and remove the animals with a greater likelihood of carrying the disease, we might stand our best chance of controlling CWD on a larger scale, while minimizing the impact on the larger deer population or diminishing deer hunting opportunities,” Wayne Laroch, the PGC's special assistant on CWD, said in a January press release.